Since it is spring and Easter is around the corner, I thought I’d toot my own horn and let you know of a pattern that’s available in my store – my Grandpa Easter Bunny! 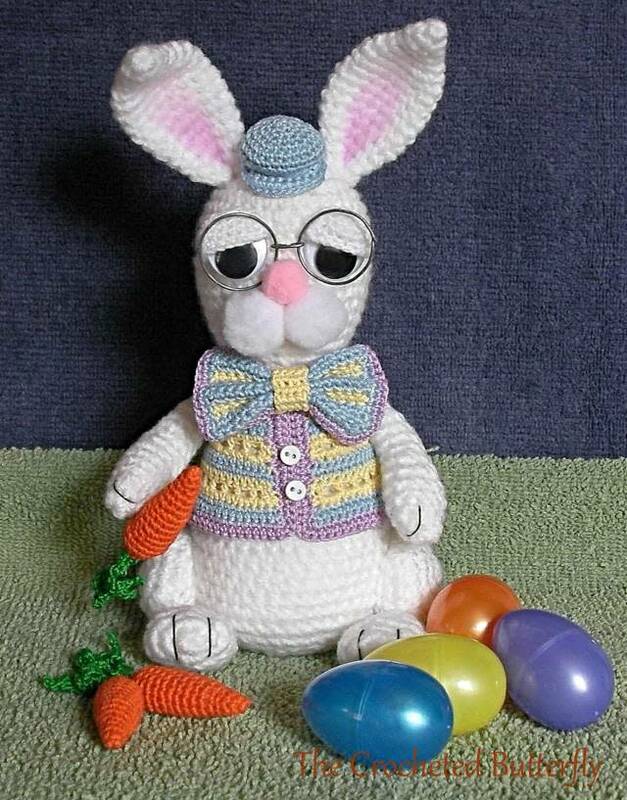 He’s all decked out in his Easter finery, and there’s even a free carrot pattern that can be ordered with him. He’s crocheted from about 100 yards of white sport-weight acrylic yarn (3.5mm hook), small amounts of size 10 cotton crochet thread (2.00 mm hook) for the clothes, pompoms for the muzzle/nose/tail, and 15 – 20mm wiggle eyes. He ends up about 8" tall, depending on how you pose the ears. The pattern is written in English using U.S. terms. I would recommend this pattern for an intermediate crocheter, or one that is well-versed in making amigurumi. Please note that pattern delivery isn’t immediate. I have to email it to you, and I check my store every morning for purchases. My sister feels that grandpa is lonely and is in need of a companion, and she has been patiently waiting for me to create a grandma version. I believe she’s right, but it always seems that I’m knee deep in other projects when it’s this time of year. I am lucky, though – Grandpa Easter Bunny hasn’t complained so far, and he’s always happy when spring comes around. Perhaps you can make one of your own to join your family this Easter!